I’m back guys! This palette is amazing, I am so excited to share these eyeshadows with you. First of all the packaging is totally stunning, it feels nice and sturdy and the pink, white and gold is such a cute look! 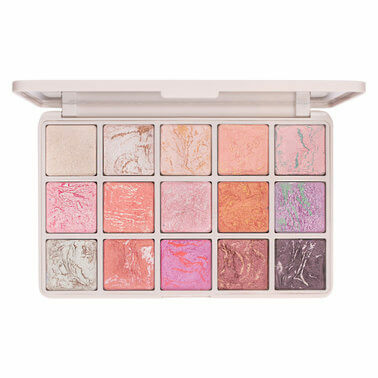 Opening up this palette you see all these stunning glittery eyeshadows with the gorgeous marble effect, I love the fact these are all shimmery because its the perfect addition to the million matte brown eyeshadows I already own. This is a beautiful addition to my collection, the mint green has to be my favorite colour in this collection. These shadows all have a shimmering finish and they do have a little fall out in the pan but that’s the case with all pigmented eyeshadows. There is a nice variety of colours that you don’t normally find in an eyeshadow palette. I like the formula of these because you can spread a small amount of product over your lid for a soft shimmer or you can pack the colour on over concealer or with a damp brush for a serious punch of colour.